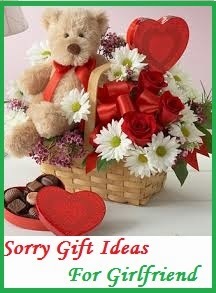 Buying a gift for a girlfriend can be difficult and it becomes more difficult when you need to consider a sorry gift. Most girls would have everything and finding what she doesn't have is difficult. However, it is not impossible to find a sorry gift that suits her personality and one that will help you to get your apology messages accepted by her. Read on to find the perfect I am sorry gift for your girlfriend. Hand painted portrait: This is an example of a unique gift. You could consider one, if you are an artist or you could get someone to draw her portrait. Frame it and turn it into a beautiful gift. Pack and place at her table with a sorry message that reads "I am sorry for hurting........ Hope this gift from me will bring a smile on your face." Handmade gifts: If you could create something out of your creativity, go to the craft supply store and try to make something that will put a smile on her face. If your girlfriend loves bracelet, necklace and other things, make one based on your creativity. A sorry gift need not be complicated or expensive. Sometimes, simple handmade sorry gifts will do wonders than an expensive gift. Sprouts: Might sound funny, but this can be an ideal sorry gift. It can also be a healthy treat for her. It is easy to find a sprout pack and this would be best if she is into bit of growing her own veggies. Squidgy veggies with great flavour will surely melt her heart. Clip on a sorry message as " I am rueful for........... Hope you will enjoy sprouting and eating my sprouts." Fuzzy feet slippers: Let her warm her cold tootsies with the fuzzy feet slippers. Find one with great animal characters or any other character that would bring a smile on her face. " I am really sorry for hurting you this morning. Accept my apologies and my lovely gift for you." Teddy Bear: Adorable teddy bears will be loved by her. To make it a more personalised sorry gift, get an " I am sorry" Teddy bear with her first name. If it is hard to find one with her first name, simple write a sorry message along with the gift or embroider her name. Jewellery: A piece of jewellery is a classic gift considered to be an ideal sorry gift for girlfriends. Need not be an expensive one, but find something as a simple bracelet, chain or a ring with crystals and sparkling stones. If you are poetic, add some poetic message to your " I am sorry" card. Poetic lines will let the her realise that your are serious about the relationship. However, those lines will clearly serve its purpose when it is accompanied by a carefully crafted apology message from the bottom of your heart. Consider her likes and personality before buying any gift. You know her better and if you aren't sure, get the opinion of her parents or siblings who knows her better than you.